This hostel is super cute and the location is amazing. The rooftop provides an outstanding view over the city! The best part about the hostel was the staff! They were super helpful and relaxed. Also the breakfast was super good. Overall we felt very welcome and as part of a family there. Classic hostel, and very friendly staff. The homemade breakfast in the morning was a huge plus. Great hostel with very friendly staff. Incredible views over the town from the top floor, which we were lucky to be located on. Many outside sitting areas to relax in which you can watch the world go by. Different very tasty breakfast offered every day is a massive plus. Decorations in the hotel are very traditional and nice. Quiet hostel with relaxing rooms. Great value for money. Only bad thing is it's located halfway through a callejon, so no cars can enter, so quite a few stairs to climb. 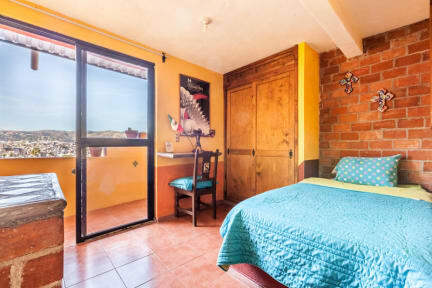 Casa de Dante is a great hostel. The staff is extremely helpful. They speak English and Spanish. Some people say the stairs are too brutal or the hostel is located poorley but I disagree. I think the location is great if you want to be removed from the noisey downtown at night. The stairs aren’t that bad either. Protip! Take the Funicular and walk along Panoramica to get back to the hostel without those stairs. Really nice place with awesome views and great breakfast (like all previous reviews have mentioned). The only thing is that there is not really a common area except for the terrace which is more to relax alone, so if you don't have a fun crowd in your dorm, you won't meet that many people. Also, they don't have any activities or make an effort for people to meet (plus, I think they're a bit picky with all their house rules). I loved this hostel. Incredible breakfasts and nice set up. Weirdly though the lady who cleans insists on making your bed to her preference every day which means folding up the sheets (you need them completely unspread to not get cold). So daily you spend ten mins undoing her work and she spends ten mins doing it again. She also moves anything you’ve left on your bed to another bed, which means you have a game of hide and seek to find it all when you get back from a day out. This family owned hostel is comfortable, clean and the staff is just super nice. There is always someone if you need anything, they are all super polite and attentive to guests. At times, they even put up handmade flags of their guest’s country to welcome them! Breakfast is good typical Mexican food. Roof terrasse is great and the view is the best you can get. It’s quite a walk from the center, because of the stairs, a little workout! We had booked for 2 nights and stayed 6. Beautiful city. 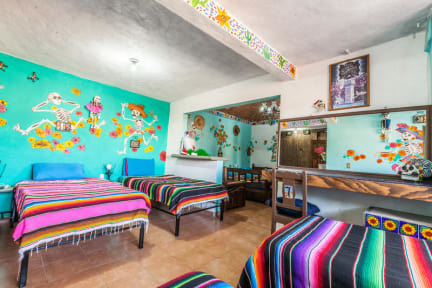 Clean, vibrant hostel. Great facilities and staff. Beware of the 160 steps going to and from the town for those with mobility issues. Town was a nice 10 min walk away- chill place to get away from the bustling town. Great terrace with amazing sunset views. Also 10 minutes walk from the finicular and El Pipila for views of the whole city. The hostal had a nice view of the city, but as it was outside the city center, we had to take an Uber home every night, which was a bit annoying, as it was not necessary at all if we had lived in the centre. The breakfast was good the first morning and quite weird the second, with no alternative. Everywhere on the walls they have put up a lot of different rules, which felt a bit discouraging. Staff was nice and the rooms were big and colourful. Close walk to the city centre.